In a previous blog post I explained the ins and outs of the new Advanced Actions dialog box. If you feel confused about my terminology in this more practical blog post, please read that first article. A decision block of type 'While' is totally new in version 2017. It has some similarities with the Conditional decision block (IF, Then, Else) but offers new possibilities as you'll see in this simple game. The While loop can be used to create a looping sequence of commands. That loop can be infinite, or limited in number of executions, based on one condition or a combination of conditions. Mohana Das from the Adobe team published recently this article demonstrating the infinite While loop. Please read that article, for users familiar with advanced actions the used condition 'IF 1 is equal to 1' will be easily recognized, since this was the condition needed to create a mimicked standard action decision in older versions. It means that the sequence of commands will continue to be done, since that condition always results in True. In a future blog post, I will offer some tips about breaking such an infinite loop. The present article will focus on using the While loop, based on a condition which results in having the commands sequence repeated a limited number of times. 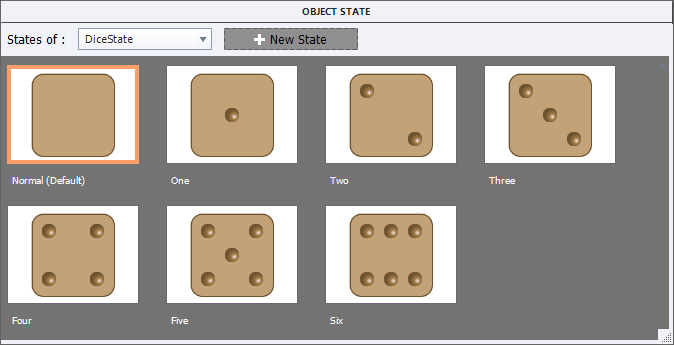 It is a very simple game, every object was created within Captivate. One exception: the color shift in the Characters was achieved using roundtripping with Photoshop. It is not a responsive project, to avoid a too long article (should have to explain setup in fluid boxes with logic of the variables and advanced actions). Maybe in a next article? Download this published folder (HTML5). Sorry, cannot embed it in this post (allows only SWF's and it is not playing well in Flash output). Unzip the folder, launch the index.html file to start playing. It is a small game: when you click on the Play button, a dice will be rolled and you'll see one of the faces of the dice, indicating a (random) number. The girl is supposed to climb the stairs, she will go up as many steps as the number you won. The goal is to reach the top. 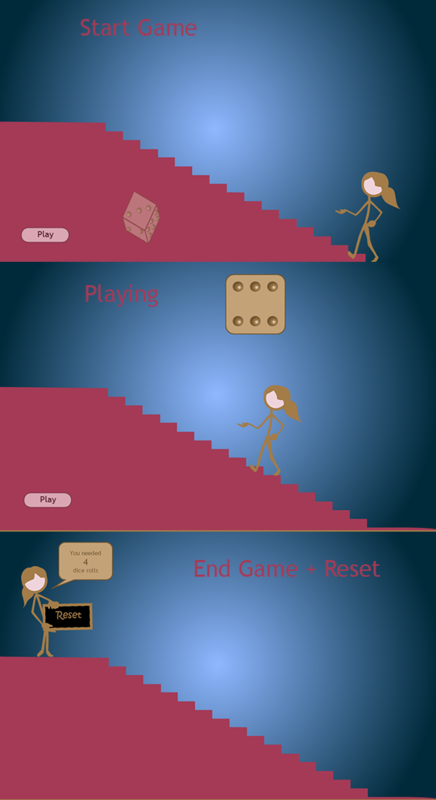 When the girl reaches the top of the stairs, clicking on the Play button will result in another scenario, and a Reset button will appear. On entering the Game slide you'll see two looping animations, with added randomness and a possibility to stop the the looping. You'll see this action in Preview, but I will not provide details. I created the stairs as a freeform shape. That was pretty easy with Guides (see Guides Rule) and Snapping to guides. Of course a better approach would be to create that shape in Illustrator with export to SVG, but it is always a challenge to use only the available Captivate tools. Dice: this is a multistate object, the normal state is a square shape, for each of the sides circular shapes with a gradient fill are added. Look at the Object state panel for this object. The 3D animated dice has also been created as a group from a lot of shapes. Two custom motion effects were created for the climbing girl. Default effects couldn't be used in the advanced action, because the path had to be edited. Here are two screenshots of the custom effects: Impatience (before starting game) and StepUp (during play). 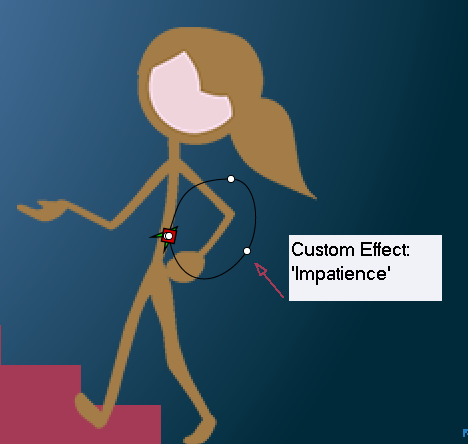 The original Character (climbing the stairs) will disappear with a default Exit effect 'Zoom out'. when the top is reached. The Sticky image that replaces the original one climbing the stairs, will get a default Entrance effect 'Drop in and Bounce'. The text panel in that image is covered with a click box, functioning as a Reset button. Play button: is a simple transparent button. v_stair: is a second counter, that will be used to keep track of the total number of steps done. It is needed to know when top is reached. The staircase has 16 steps. It also starts with a value=0. 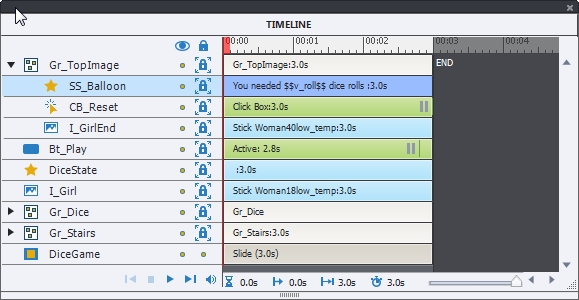 v_roll: starts with a value=0, will track the number of dice rolls needed to complete the steps; that number appears after the top of the stairs is reached. It is a third counter. For the EnterGame action a 6th variable v_anim is used. 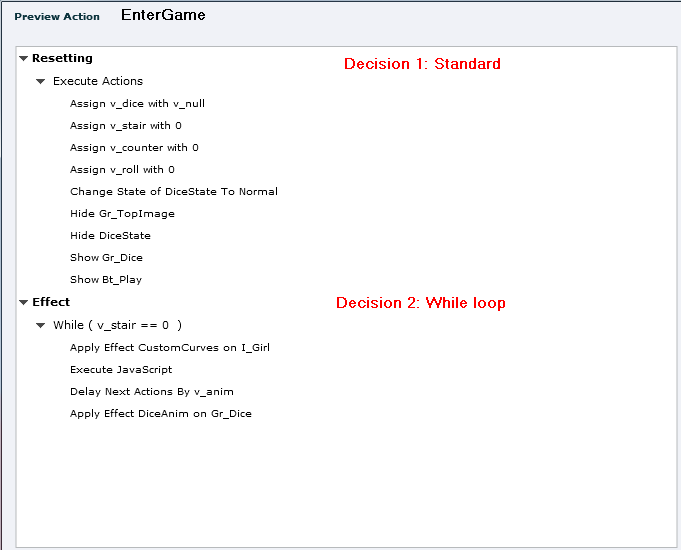 Due to the command 'Continue', the On Enter action of the game slide (second slide) is always executed. At this moment for HTML5 output this is not the case when using micronavigation (as in the blog post about Replay slide). With this sequence, the 3D dice (animated On Enter) will be hidden and replaced by the static dice in its Normal state. The variable v_counter is reset to 0. It is important that this is done before the While loop in the third decision. This decision checks if the character has reached the top by comparing the user variable v_stair with the total number of steps (16). Contrary to v_counter, v_stair is only reset to 0 when re-entering the Game slide (using ResetAct). The Play button is hidden (to avoid disturbing the rest of the sequence) and the static multistate dice. The original character disappears, is replaced by a group (character + click box + text balloon) with some default effects. If the condition is not fulfilled (ELSE), which means the top has not yet been reached, the variable v_roll is incremented by 1. The total number of steps done, stored in v_stair, cannot be greater than 16, number of steps in this staircase. Character gets on the next step (using custom effect StepUp, but that name has been changed by Captivate to the name of the effect it was based on 'RightToLeft'. The variable v_stair is incremented; that variable is not reset by clicking on the Play button, is necessary to check if the top is reached (decision 2 'EndCheck'). Fire away. Creating this game was a lot of fun, 'while' exploring 'while' loops. Let your creative juices surge! Knowledge check slide imbibes similar features of question slide without any results, reporting structure and interaction ids. Knowledge check slides do not participate in reviews. Random questions are not applicable to this knowledge check slide. Master slide and controls usage is similar to question slide. Knowledge check slides can be used to impart the learning on specific topics. I explored those KC slides in preparation for a workshop about new Quizzing features, and want to give you some more tips. Since the KC slides are very similar to normal quiz slides, I'll start with 'Recognizing KC slides'. Then I'll show the differences in default setup, and in some other aspects not mentioned in the Help, the relationship with the quizzing system variables and - what did you expect? - a tweaking tip. There is no way to convert a KC slide into a question slide, nor a question slide into a KC slide! For both KC and Question slide only the Submit button is checked off. The Back, Skip and Clear buttons can be activated, but they are not by default. Attempts are set to Infinite, with the Retry Message enabled. For question slides by default Attempts is set to 1. Because the attempts are set to infinite, you don't have a Failure message enabled for KC slides. You can decrease the attempts and in that case you can provide up to 3 Failure message, same as for Question slides. You read in the Help that KC slides will not be visited during Review, they are not in the Quiz scope, except of course if they are nested in between normal quiz slides. Contrary to Pretest slides, the KC slides will not prevent navigation by playbar or TOC. It is not possible to use question pools (see Help), random questions but it is also not possible to use GIFT format to import KC slides. Some options in the Quiz Preferences do work for KC-slides: if you check the option to Hide Playbar in Quiz, this will be valid both for question slides and KC slides. Unchecking the option 'Allow Backwards Movement' will only prevent backwards movement on question slides, not on KC slides. However, KC slides do not get a Progress indicator! IIf you want a progress indicator (question X of Y) you can have a look at this older blog post.. 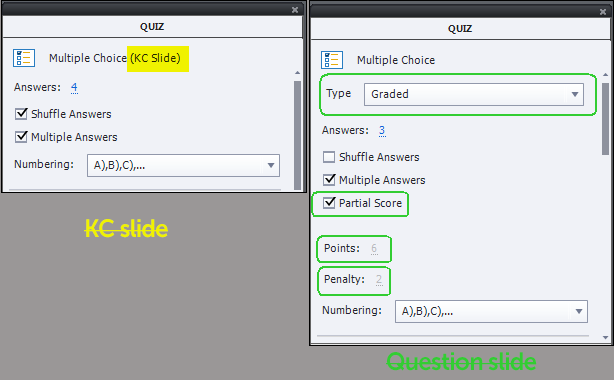 When you leave a KC slide, it is reset immediately which is not the case for question slides which are frozen until a new attempt on Quiz level is started. In that way a KC slide behaves like a Drag&Drop slide that is not set to be reported, had no score. There is no possibility to freeze the answer on a KC slide, which may be a game stopper sometimes. As the Help mentioned, design of the KC slides depends on the same master slides as the normal question slides, with the exception of the new Review buttons which will never appear on KC slides. For navigation on KC slides you can use the Back/Skip buttons or add custom shape buttons. cpInQuizScope and cpInReviewMode, both Booleans will not be toggled from the default 'false' to 'true' when you enter a KC slide. If the KC slide is in between normal question slides, it can be 'true' but that is not due to the KC slides. cpQuizInfoAttempts: gives the attempts on Quiz level, as specified in 'Quiz Preferences, Pass or Fail'. Those attempts have no sense for KC slides, since the user can come back as many times as he wants to retake the KC question which is always reset when leaving the slide. cpQuizInfoPassPercent and cpQuizInfoPassPoints: since KC slides have no score, those settings of the Quiz Preferences have no meaning for KC slides. cpQuizInfoAnswerChoice: one of my favorites as you could read in this old blog post. 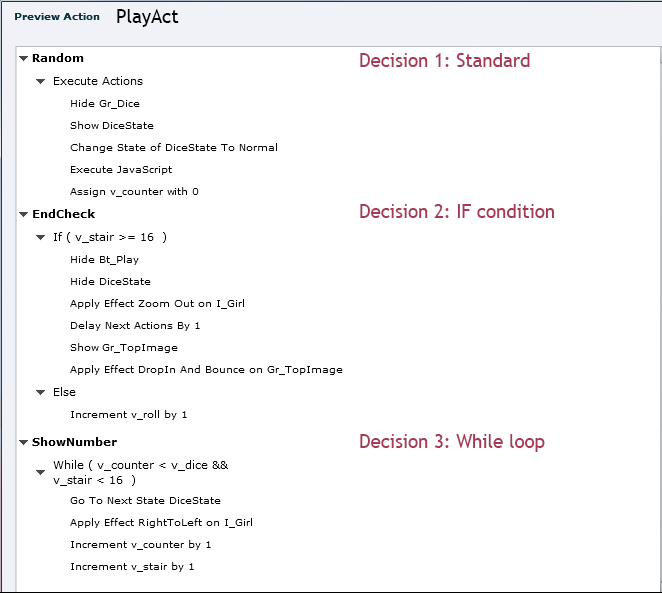 It can be used to tweak the work flow with KC slides as you'll read more later on. One exception: it is not populated when you use Advanced Answer option. cpQuizInfoMaxAttemptsOnCurrentQuestion: can be useful as well, although having a similar system variable to cpQuizInfoAttempts for current attempt on question level would be even better. You need a user variable as a counter for attempts on question level. If you keep the default setting of Infinite attempts, this variable will have the value 32767 (no idea why?). cpQuizInfoQuestionSlideTiming and cpQuizInfoQuestionSlideType are available for KC slides as well. Here are some tips, which I tried out with success but will not explain in detail. If you do not want to keep the Attempts set at Infinite, but to a limited number it would be possible to count the number of correctly answered KC slides. Create a user variable v_counter with a default value of 0. Use the Success action of the KC slides to increment that counter. Later on you can show the obtained value for v_counter, and even use that value in a conditional action to offer feedback or navigate the user back to content slides. There is no Review possibility for KC slides as mentioned. If you offer limited attempts on question level, you could show a custom feedback message on the KC slide for the questions answered correctly, something like 'You have answered this question correctly'. When simulating a 'Review' situation, the user will be invited to answer only the KC questions that do not show that message. Be careful: all embedded question slide objects are always on top of the stack, you don't want the feedback to be hidden by those objects. That can be done by having a shape before the KC slide, timed for the rest of the project and always on top. This tweaking work flow was described in this article: Buttons on Question/Score slides?